What a GRIND !! The PERFECT Ground Beef story. I’m often asked questions about Ground Beef. Which one makes the best burgers? What’s in it? Are there any fillers? Why is it dark on the inside? (please see my Carnivore Confidential post “How ’bout a little love” published 2013/02/06) What’s the fat to lean ratio? Well, in order to answer those questions, I need to first tell you a little bit about Ground Beef, and how it’s made. Years ago (and still, in certain boutique Butcher shops) you will see “Ground Chuck” “Ground Round” and Ground Sirloin”. More often than not now though, you will find the terms “Regular”, “Medium”, “Lean” and “Extra Lean” Ground Beef. The reason ground beef today is generally marked as Regular, Medium, Lean and Extra Lean is because for the most part ALL the trimmings from all the different parts of the carcass are tossed into the same lugs. There will be a mixture of trim from the Shoulder, Hip, Sirloin as well as everything else such as the Brisket, Point, Flank, Neck and Shanks. As you can see, it’s now a mixture of trim from all over the carcass and hence the name “Ground Beef”. The Regular, Medium, Lean and Extra Lean designations are arrived at by determining the fat content of each one. In some cases, the store will mix their “house” trimmings with really lean tubes of Cryovaced Ground Beef from the slaughterhouse. These Cryovaced tubes are usually 80/20 or 86/14 meaning 80% Lean and 20% fat … you get the picture. They vary depending on the requirements of the meat department for example: during the day the “House Trim” is ground, then a determination is made on how many tubes are needed in order to make it fall within the “Fat Test Range” established by the store. If the package says “Lean Ground Beef no more that 15% fat” then you can reasonably assume a “Fat Test” has been performed, and the Ground Beef has tested “Less than 15%” which allows it to be called “Lean Ground Beef”. Ok so, what makes the BEST hamburgers?? 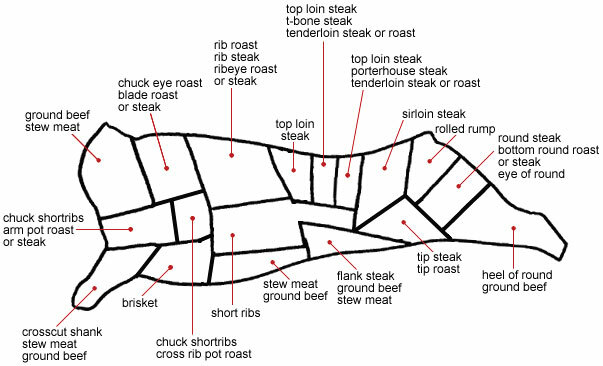 Well, this will vary from person to person BUT, … I can tell you MY personal favourite is a mixture of cuts beginning with BLADE EYES then, I like to add boneless SHORT RIBS and, BRISKET. BEHOLD!! The beautiful Blade (Chuck) Eye. 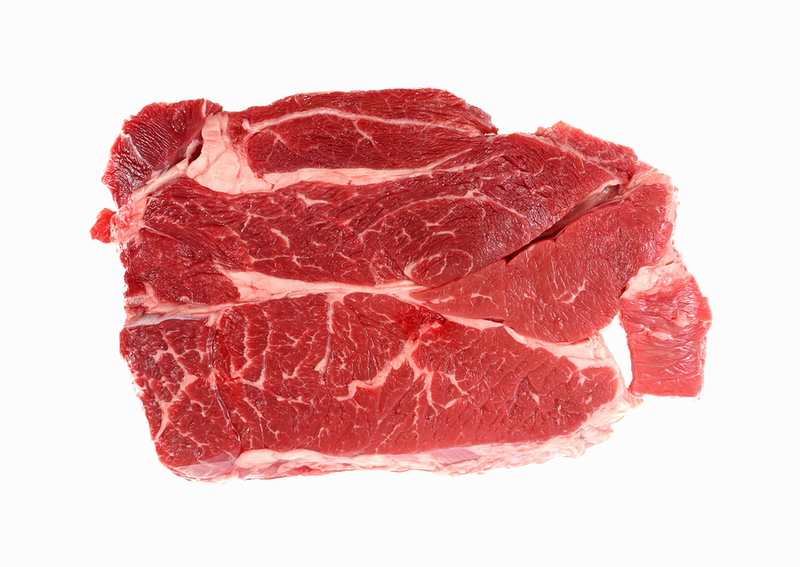 Note: the marbling and fat … mmmmmm! The ratio of fat to lean plus, the benefit of lots of connective tissue and collagen makes this selection of cuts an EXCELLENT, if the not THE VERY BEST choice for ground beef. The front shoulder is the area of the carcass I ALWAYS use when I’m making Ground Beef for anything … Meatloaf, Spaghetti sauce, Tacos and Burritos, especially BURGERS!! 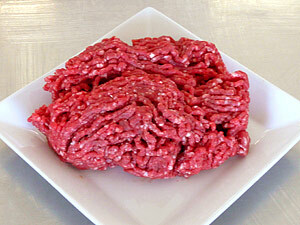 AND … the ONLY thing that ALWAYS makes this Ground Beef better is … PORK FAT! 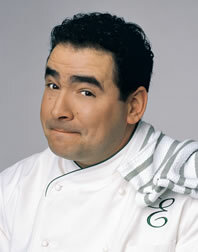 Yup,… just ask Emeril Lagasse! When in doubt … add Pork fat!! I ALWAYS add Pork fat when I grind my beef mixture … it makes (in my humble opinion) the very BEST Ground Beef, for ANY application you can find (excuse me while I wipe my chin). Lastly, … I know there are a LOT of people who swear by the “Trinity”, Ground Beef, Ground Pork and Ground Veal. And I say Hey, … live and let live. For me … Ground Blade (chuck) eyes, Short ribs, Brisket and Pork fat makes the Angels sing and … why fix what ain’t broke!! One final thought about the perfect Ground beef and, this is VERY important people. When making burgers (or anything, really) it’s vitally important NOT to overwork the meat before forming it into patties. Believe me folks, care needs to be taken here or you’ll end up disappointed.